Jellyfish have been in the news* recently with an article on the ABC by Hong Jiang and Sasha Fegan linking them with climate change noting how they have been blocking the water intakes of power plants in Japan and how suited they are to taking advantage of global warming’s warmer waters. This was followed by a podcast of Phillip Adams interviewing jellyfish scientist Juli Berwald and a Guardian article on a large number of tourists being stung by them on Queensland’s beaches. This reminded me of the series entitled ‘Jellyfish and Chips’ by Inverloch artist Ray Dahlstrom whose work I have written about on several occasions (see here and here ). This series – commenced more than 5 years ago – depicts our oceans overwhelmed by jellyfish with the skeletal remains of fish on dark blue canvas; a foreboding apocalyptic vision. The artist saw this proliferation as a result mainly of our oceans slowly acidifying – a sort of by-product of burning fossil fuels and global warming. When the warming oceans are added to the acidification Ray’s prophetic vision may well materialise before our eyes. 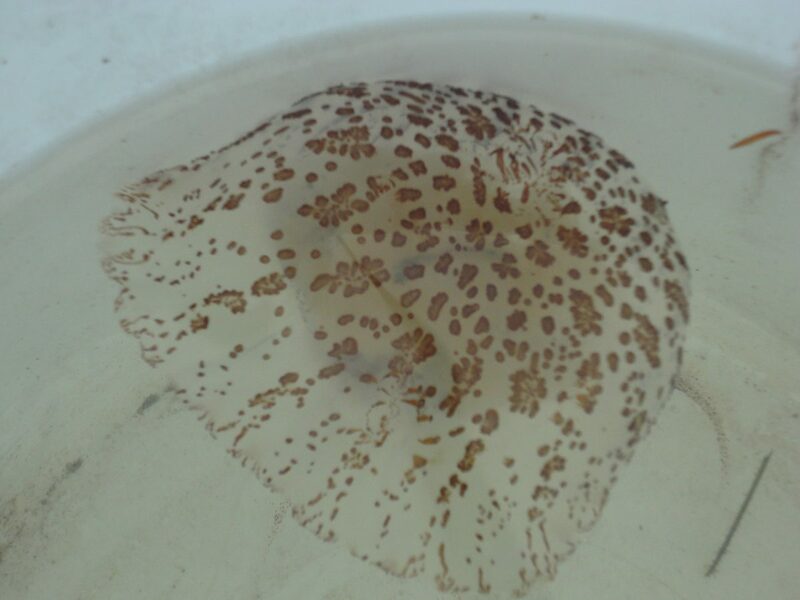 It also reminded me of a very early post to this blog of a new species of unidentified jellyfish** (image above) found in the Gippsland Lakes.This species was first found in 2013 by Gippsland Lakes identity Ross Scott and it was suggested that the species had migrated southwards with our warming waters. The warming oceans off our coast have been clearly measured and identified by the Bureau of Meteorology and others as a ‘hotspot’. This Xmas time I observed unusually large numbers of small jellyfish in the brackish waters of Lake Bunga but they are now gone. Imagine a fishing industry destroyed by exploding populations of jellyfish and a tourist industry blighted by a range of new and toxic, stinging species colonising our beaches. And if there is no fishing and no swimming, Lakes Entrance will hardly survive long enough to be submerged by floods and rising seas. “Jellyfish and Chips” indeed.